Every morning, racing to keep up because the day is happening all around you. You need to get out the door, still in your pj’s but don’t know what to wear. The weather doesn’t help because it’s chilly right now, but it’s very likely to warm up – or could it snow? (after all, this is Hobart!). You fling open your wardrobe doors and you’re instantly neck deep, arms flailing as you rummage through, impatiently pushing aside that gorgeous dress you’ll never wear again (how was my waist ever that small? ), flicking past those red pants that aren’t ‘my colour’ anymore, and pausing momentarily to (guiltily) contemplate finally wearing that skirt you bought on a whim (it’s bound to go with something, surely….). Then, glancing at the clock, you curse under your breath as you frantically toss it across the floor. With an exasperated sigh, you resign yourself to chucking on that safe and comfortable favourite…again. And, then, you’re off. But as you swipe up your keys, you swear to yourself that you WILL sort that wardrobe out this weekend and have done with the daily chaos of it all! That was me most days. So, the weekend rolls around (much too fast this time) and your bulging wardrobe beckons (coat tails and scarves tauntingly sticking out door cracks, refusing to be tamed). Here’s my quick and easy 7 step approach to taming your wardrobe. Step 1 Delay tactics – make a cuppa. Keep. Keep, with some alteration or mending. Maybe. Donate. Throw. Sell. For many, even making these ‘cull’ decisions can be hard – and that’s a whole other conversation for another day. Step 6 Have a break, maybe another cuppa (and a chocolate biscuit this time – for the energy to go on, you understand), or take the dog for a walk (oh, wait, I don’t have a dog…but, of course, you might), or go for a brisk walk on the local beach. Step 7 Back at it – second sweep – revisit the piles in more detail, maybe trying on, but be ruthless! Keep. Really, absolutely – I wear it often, it will be great for the upcoming dinner/meeting/Christmas party, or whatever … If it’s none of that – move it along to another pile. Keep, with some alteration or mending. Maybe…actually, I’ll never get around to it. Move it along. Maybe. Nope, I’ve said ‘maybe’ too many times. Move it along. Donate. Is it good enough to donate or is it pretty worn out/marked/damaged? Over it goes to the ‘throw’ pile. Throw. Pretty straightforward – but consider recycling first – can it be used as rags, etc.? Sell. 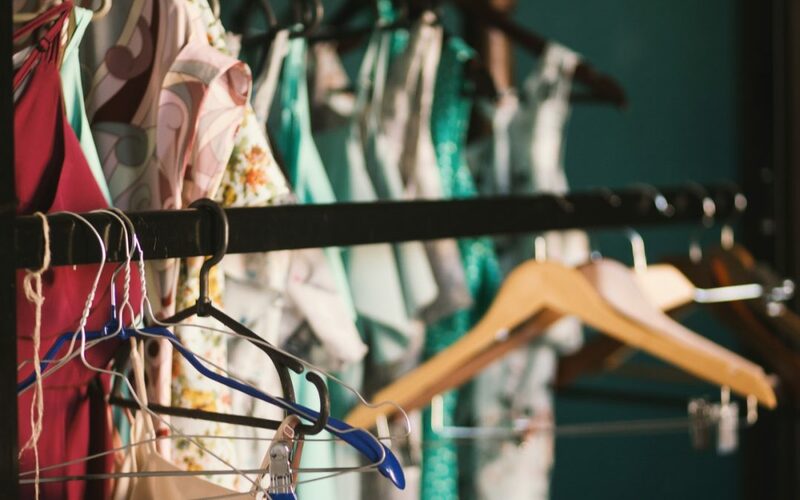 Here’s where preloved clothing markets come in! Gearing up (excuse the pun!) to sell your preloved clothing. ​How I started was by selling some items on eBay – still do, and love it. It started off as time consuming and there’s a bit of setting up before it becomes a quick, easy and smooth operation. Mavis the mannequin comes in very handy for this exercise. I’ll present a quick and easy process in another conversation. But always consider, there’s bound to be something that you may want more for than you might get at a preloved market, and eBay can be just the place. Over the years, I’d sold bits and pieces at markets and garage sales – usually alongside other household goods or knick-knacks. Most of us probably have. But now I wanted to seriously turn my ‘fash into cash’ . So, one day I dusted down my two clothes racks and assembled them (after the obligatory rummaging around for all the necessary bits and bolts – I always think I’ll remember where I put ‘that thing’. But who am I kidding these days!). And, ready to go, I did a test run of hanging up all the items in my ‘sell’ pile.